Videcom provide both legacy command line interfaces as well as a full graphical interface giving the best of both worlds. Many experienced airlines staff prefer the speed and simplicity of command line interfaces, while other users prefer to use our state of the art graphical interface which requires only minimal training. By providing a full graphical user interface for airline staff to use the training times are dramatically reduced which means that even seasonal staff can be trained in a few hours. The interface is very intuitive and experienced airline staff are able to adapt to using the interface without any training at all. The VRS VARS call center interface offers a very high level of functionality so that airline staff can make complex bookings with ease. There are many tools which allow short cuts to speed up transaction times and entering data in bulk to provide a very rapid booking process. Call Center Staff can quickly and easily view flight availability searching by route and date. Users can request up to 4 different routes in a single availability query and the system will return all available flights within a given time frame for each route. Inventory can then be booked directly from the availability display with a single click and the seats will be taken immediately from the system inventory levels. Over the past few years airlines have realized the revenue potential of maximizing the sales of ancillary products with their flights. Providing the facility for your passengers to book these products online is the ideal way to increase your revenue while minimizing the costs of administration of these value added sales. In addition to basic contact details airline staff can recall passenger profiles from the database which will display all the cotact details for a passenger that has created a profile and store them to the booking in a single click. You can also use the contact details from the booking to create a new profile so that when the passenger makes another booking all their details are on hand immediately. Frequent Flyer details can also be added to the booking from this screen so that members can receive airmiles from the booking. Airline staf can add SSR's to bookings either as part of the booking process of when they revisit a booking at a later date. 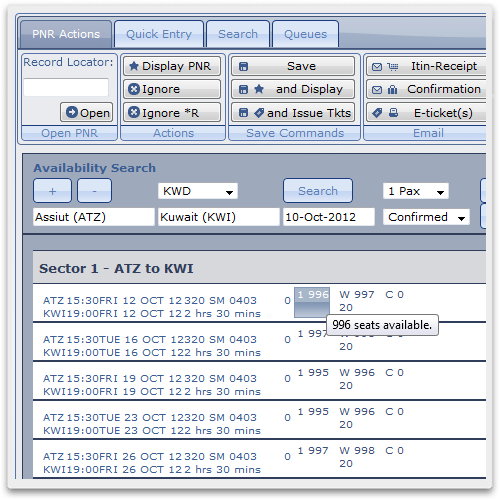 All special service requests are stored in the booking in real time and visible on SSR lists for flights throughout the system. SSR lists can be sent via email or TTY message to the airport, and they are also included on the Passenger Name Lists (PNL) sent to handing agents for check-in by 3rd parties. If you're using VRS to check-in at the airport the SSR's for all bookings on the flight are visible to your check-in staff and are also included on the Passenger Information List (PIL) for airline crew to take on board. Prior to tickets being issued within the system the airline agent will need to enter a payment record within the booking to equal the fare stored in the booking. The system can accept both multiple forms of payment allowing passengers to mix for example a Credit Card payment with Cash and an unlimited number of payments can be entered until the fare required is reached. If a booking is divided the system will allocate payment between the 2 bookings to ensure that they are balanced. At any time the user can display a balance sheet that shows the breakdown and value of the fare quote and the payments that have been stored in the booking. We don't use a 3rd party Eticket database. VRS comes with a fully integrated, built-in Eticketing for all ticketing requirements from all distribution channels - Call Center, Internet Bookings, GDS and Interlines. Ticketing is fully IATA compliant and connected to all other major Eticketing databases such as Amadeus, Sabre, Worldspan, Galileo, Apollo, Mercator, SITA and Deltamatic. This provides your airline with the capability of distributing your tickets through all major distribution networks and collect funds through BSP & IDEC. For booking being taken by the call center directly the tickets would be internal airline etickets. This is a non BSP ticket where settlement is collected directly usually through credit cards payment, cash or invoice. Free flow text remarks can be made to a booking which allows airline staff to make notes for other reservations staff and airport staff to read. These are usually special remarks regarding the customer or hsitory of teh booking. All tranactions are logged within the system and the airline agent can view a full audit history for the booking which shows which user carried out each change to a booking and at what time.